César Chávez — speaking at the Delano UFW−United Farm Workers rally in Delano, California, June 1972. Birthplace: near Yuma, Arizona, U.S.
Cesar Chavez was an iconic Mexican-American labor leader and civil rights activist who co-founded the National Farm Workers Association (later called the United Farm Workers) to fight for the rights of farm workers. He popularized the slogan 'si, se puede' which is Spanish for "Yes, it can be done". The slogan was later adopted by Barack Obama for his 2008 campaign slogan "Yes We Can". He married Helen Fabela on October 22, 1948 and had eight children with her. He remained married to her until his death in 1993. His birthday, March 31st, is a state holiday in California, Texas, and Colorado. It is called Cesar Chavez Day. Cesar Chavez Day — poster in the United States. César Chávez visitas colegio César Chávez en 1974, un año después de la escuela abrió. estaba allí para mostrar su apoyo a la nueva escuela que fue nombrada en su honor. 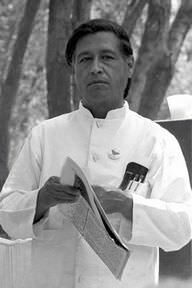 Cesar Chavez was a famous Farm worker, labor leader and activist, who was born on March 31, 1927. As a person born on this date, Cesar Chavez is listed in our database as the 1st most popular celebrity for the day (March 31) and the 2nd most popular for the year (1927). People born on March 31 fall under the Zodiac sign of Aries, the Ram. Cesar Chavez is the 15th most popular Aries. In general, Cesar Chavez ranks as the 159th most popular famous person of all time. “The Famous Birthdays” catalogs over 25,000 famous people, everyone from actors to singers to scientists to serial killers and more. If you're curious to see who was born on your birthday, you can use our database to find out who, what, where, when and why. You can search by birthday, birthplace, claim to fame or any other information by typing in the search box, or simply browse our site by selecting the month, the day, the horoscope, or any other clickable option.